Fit-to-go is a mobile Sports Training service whereby I bring my training expertise and my training equipment to your home or place of business via my van. Over the past three years I've developed a regime of body-weight resistance exercises that have proved to be enormously successful with virtually all levels of participants, from elite level endurance athletes to the general unconditioned population who are just beginning a fitness program. First let me start off by explaining that it's a common misconception that body-weight exercises do not build substantial strength but are better suited for building endurance. 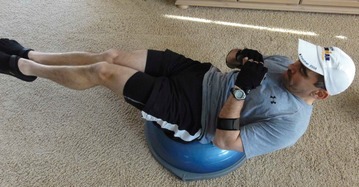 And as you can imagine, when most people contemplate utilizing body weight resistance programs they envision themselves painfully enduring sessions of endless pushups, sit-ups, pull-ups and dips - all exercises that may be wonderful for general fitness or endurance, but that hold little value in building real strength and core stability. Yet resistance is resistance. Period! When muscles contract against resistance over time they become stronger. If you are looking for your muscular strength to increase and if your are looking to gain lean muscle tissue, then you must gradually increase the amount of resistance or load over time. And therein lies the issue with body-weight conditioning - as the resistance (weight of the body) is fixed, how do you continue to increase muscular strength? With my body-weight resistance program you can continually challenge the muscles by decreasing the amount of leverage in a given exercise. With that the resistance of an exercise becomes increasingly greater. Over the past several years I have designed a menu of body-weight resistance exercises that when done correctly, and when done in the proper progression, are so minimal with respect to leverage and balance that even at body-weight levels of resistance it is possible to build amazing amounts of strength. In addition to building strength and adding lean muscle mass, my clients have also developed excellent balance, coordination, agility and exceptional core strength and stability. What kind of strength can you attain with body-weight exercises? How much lean muscle mass can you acquire? Will body-weight resistance exercises help you to be a more efficient runner, cyclist, swimmer or multi-sport athlete? This regime of exercises can make you stronger, add lean muscle tissue and make you a better performer in your sport of choice. Period! Actually, I would be willing to bet that, if done correctly, these exercises will make you far and away stronger and fitter than an individual who had trained for the same amount of time with free weights. Think about it...you perform everyday life activities and/or your sporting activities in three planes of motion, not in fixed one and two dimensional positions such as when working out on the myriad of fitness benches and machines in fitness clubs. 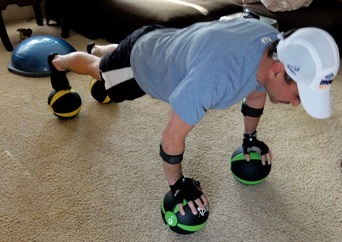 Most all of my body-weight resistance exercises are generally total body exercises, working out not only the prime movers involved in that particular exercise, but also numerous other muscle groups that are recruited as stabilizers. That leads us to another primary benefit of body-weight resistance exercises - improved proprioception. Seems to me that everywhere you workout today people are espousing the virtues of core stabilization via stability training. And though this may seem like a new craze or a temporary fad, the primary focus of this type of training is to improve proprioception. And it is real, and very valuable! What is proprioception? Proprioception is the body's ability to transmit a sense of position, analyze that information and react to the stimulation with the proper movement. In other words it is the ability to know where a body part is without having to look. 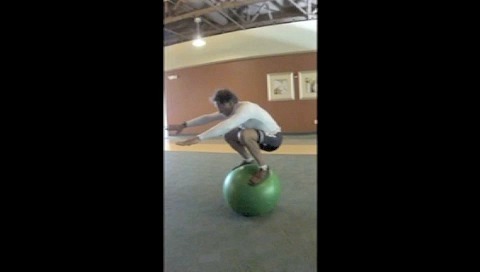 Improving your proprioception requires the same incremental, progressive steps as does improving your strength. By improving proprioception you can gain the balance skills necessary to maintain stability, increase your ability to quickly change directions, and fine-tune your coordination skills so that you can perform physical activities accurately and consistently. Improving your proprioception enables you to reduce the risk of injury in everyday life and in sporting activities. 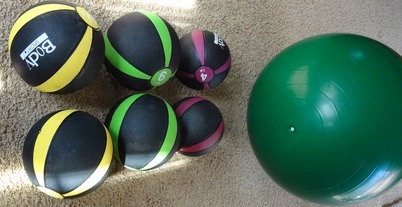 In a nutshell these are the benefits of body-weight resistance exercises. Oh yea, one more thing...they're really a lot of FUN to do!! There's always a challenge, and there's always another level of difficulty. No boredom here. If you are interested in my body-weight resistance program give me a call at 330.655.9350 or email me at pjgladd@aol.com for a free consultation. My personal training fee to work with you at your home or office is $50.00/hour if you live in Hudson and Stow, and $60.00/hour if you live in the surrounding outlying Akron area. My aim is to instruct and teach you proper exercise form and technique so that you can maintain a fitness or training program on your own - not with me as a glorified rep counter for the rest of your life!